HomeCall Centre KPIs & MetricsHow important are call centre agent soft skills? Have you ever wondered about how important call centre agent soft skills are? Are you adding the ‘human’ experience to your customer experience? With every contact your agents have with customers there are essentially two dimensions: the technical components and the softer communication elements. 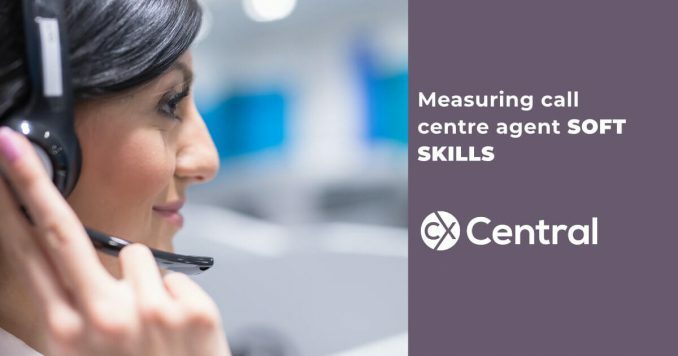 Call centre technology provider Genesys suggests the hard truth that soft skills most often have more influence on customer experience. Customers who encounter agents who are compassionate, concerned and show a sincere desire to help are the customers who remain loyal to your company. But how do you measure call centre agent soft skills in an objective manner? For example, as noted above, experts say that professionalism is one of the most critical call centre agent skills when it comes to customer experience. But what does professionalism really mean, and how can an agents professionalism be objectively evaluated? What specific behaviour should you look for when evaluating an agents professionalism? Or is it a judgment call, opening the door to a disagreement between evaluators? Furthermore, what happens if the agent was professional through only half of the call? Is the agent given credit for the skill or not? If the evaluation form uses a five-point scale, does the agent get a zero, a two, or a four? Ambiguity in measurement criteria will generate chronic variability in performance scores that is completely unrelated to the agents actual performance. Unfortunately, it is very difficult for humans to measure such soft skills without being at least somewhat subjective. The solution to this issue is actually less complicated than it might at first appear. First, you need to define your organisations primary customer experience objectives and the Key Performance Indicators (KPIs) that measure those objectives. Then youll need to identify the agent behaviours needed to achieve your organisations goals and objectives. It’s crucial to understand the difference between opinions and behaviours, because opinions are by nature subjective, while behaviours can be objectively measured and coached. Finally, by far the most effective method of objectively measuring and monitoring agent behaviours is to use Speech Analytics, which can automatically measure soft skills without any human subjectivity.